Pentecost paradigm: Revelation →→ Revolution! The Pentecost paradigm can be illustrated with these two passages from the New Testament. The events at Pentecost followed the same pattern. 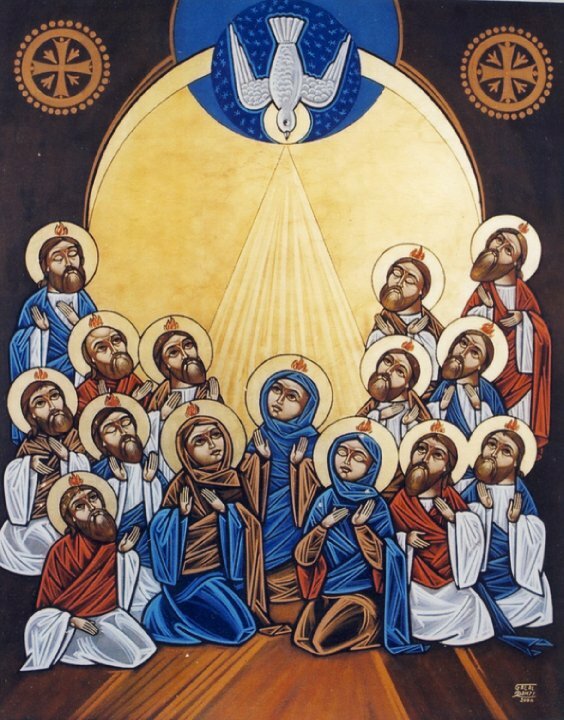 A Coptic icon for Pentecost. It’s a wonderful feature of Coptic icons to include women, in contrast to the more heavily or exclusively male presence in Byzantine icons. When the day of Pentecost had come, they were all together in one place. And suddenly from heaven there came a sound like the rush of a violent wind, and it filled the entire house where they were sitting. Divided tongues, as of fire, appeared among them, and a tongue rested on each of them. All of them were filled with the Holy Spirit and began to speak in other languages, as the Spirit gave them ability…. … So those who welcomed his message were baptized, and that day about three thousand persons were added. They devoted themselves to the apostles’ teaching and fellowship, to the breaking of bread and the prayers. 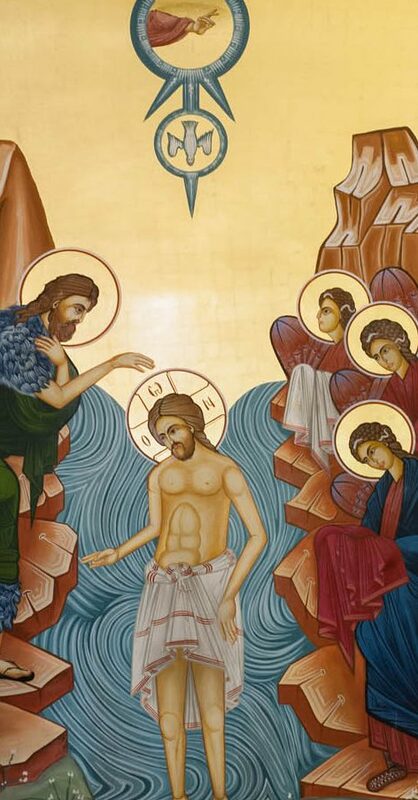 Awe (φόβος) came upon everyone, because many wonders and signs were being done by the apostles. All who believed were together and had all things in common; they would sell their possessions and goods and distribute the proceeds to all, as any had need. Day by day, as they spent much time together in the temple, they broke bread at home and ate their food with glad and generous hearts, praising God and having the goodwill of all the people. And day by day the Lord added to their number those who were being saved. Can you see from that last paragraph why I speak of revolution? It is the Spirit who offers us the life that death cannot destroy. Dynamic images for the Spirit – wind, cloud, fire, water – all essential to life. The dove? Ah, that was just God’s selfie – a one-time shot. Nothing more. The other images are the important ones! So today we celebrate life. The life the Spirit gives. The life that is revolutionary. Pentecost is an invitation to join the revolution of God’s love and the love that we humans are capable of giving and sharing. Yes, we are capable, if we can just overcome the ease with which we fall into selfish and combative ways. As the Spirit hovered over the darkness that covered the earth at the beginning of time (Genesis 1:2), may the same Spirit move among us in the prayer and community of this day, and prepare us for new life. Categories: Sermons | Tags: images of the Spirit, Pentecost | Permalink. What a wonderful wedding yesterday. Wasn’t it? The pomp and pageantry of British royal tradition with a refreshing dose of American energy. Fabulous! And the African-American Episcopal bishop who gave the homily! And that gospel choir singing “Stand By Me”! 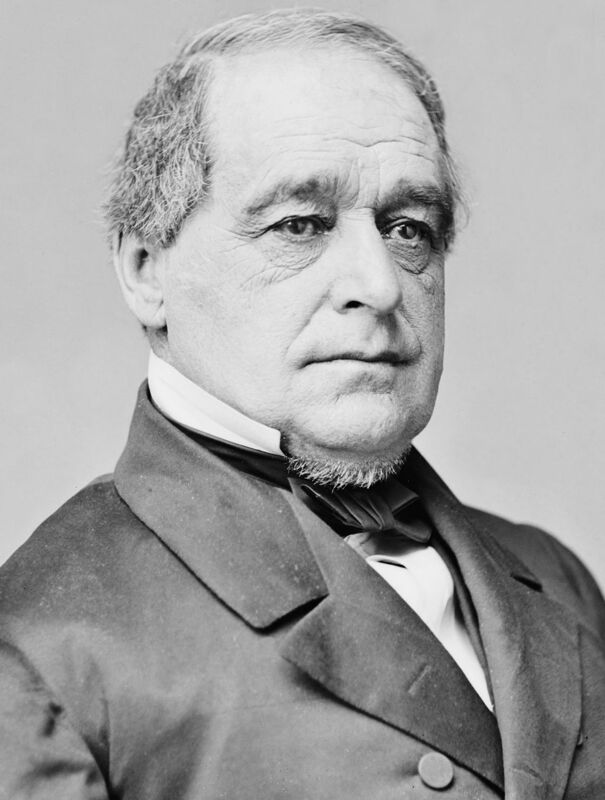 But that African-American bishop, he spoke of love – as one would expect at a wedding. But he didn’t speak of love in the trite, sentimental ways that we expect to hear at a wedding service. He brought fire into that wedding service – the fire of Christ’s love. The Archbishop of Canterbury was seated right behind him as he delivered his homily. He sat very still, and probably saying to himself, “Why can’t I deliver a sermon like this?” But he can’t; he’s British and he’s high Anglican. And let me tell you why that thought entered my mind about the Archbishop of Canterbury. It’s because that’s what I was thinking. Why can’t I preach like a black preacher? Because I’m not black. I’m Greek and I’m Orthodox, and I’m boring. I’m supposed to be boring! The good African-American bishop spoke of love, spoke with love, spoke love. He spoke of love as fire. He spoke of love as redeeming. He spoke of love of God and love of neighbor. He spoke of a love that if it were to exist, there would be no wars; there would be no poverty; no hunger. When love is the way, there would be justice and righteousness for all. “When love is the way, the earth will be a sanctuary,” he said. He spoke the love that Jesus brought into the world. The transcript of Bishop Michael Curry’s sermon can be read here. Love is everywhere in the Bible. As examples, here are passages in the writings of John in the New Testament. John 13:1 Having loved his own, he loved them to the end – εἰς τέλος ἠγάπησεν αὐτούς – to the maximum, to perfection. Do you hear that last sentence? Is that why there is no peace, no justice or righteousness in the world? Because the world does not see love even in the lives of the followers of Jesus? 1 John 3:16 We know love by this, that he laid down his life for us—and we ought to lay down our lives for one another. 1 John 4:8 Whoever does not love does not know God, for God is love. 1 John 4:19-21 We love because he first loved us. Those who say, “I love God,” and hate their brothers or sisters, are liars; for those who do not love a brother or sister whom they have seen, cannot love God whom they have not seen. The commandment we have from him is this: those who love God must love their brothers and sisters also. This is why love is fire. And this is why the fiery American preacher was right on yesterday at that royal wedding. Half the congregation probably didn’t quite know what to do with him. They don’t hear sermons like that in high Anglican churches. They got a bit of a taste of American fiery preaching. And we need some preaching like that to shake us out of our own rut and our own satisfaction with ourselves and our holy tradition and our sense of entitlement. Jesus ascended. He carried with him every human experience, everything that makes us human. He carried with him to heaven every human race, every form of human existence. That’s how great God’s love is for humanity. What do we do with that love? 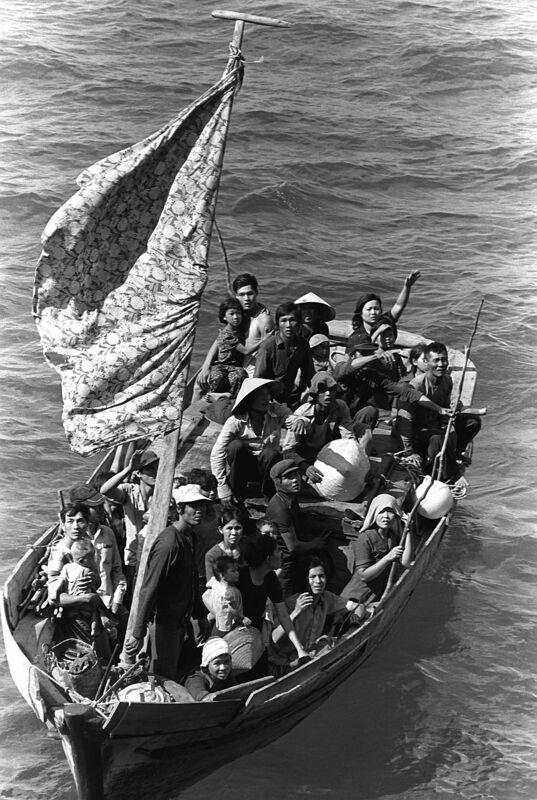 Fly flags at half mast? Pray with trite words while doing nothing to prevent the killing of our children? Is that the extent of our love? Where is the fire? Next week, on Pentecost, we will hear of how the Holy Spirit came down on the first disciples after Jesus ascended. And the Holy Spirit came down as fire. Jesus carried our shared humanity to heaven so he can send down fire – the fire that makes the world new, the fire that brings the new heaven and the new earth. That is the dream. That is the fire of love. Categories: Sermons | Tags: Ascension of Christ, Bishop Michael Curry, Pentecost, Royal wedding | Permalink. In the wake of today’s school shooting in Texas, Ted Cruz, senator from Texas, appeared before the cameras, as politicians do in order to fool voters into thinking that they care about anyone or anything. So Mr. Cruz is talking about the newest shooting and as he links it to other recent shootings and tragedies in other communities in his home state – the great gun-toting state of Texas – he starts talking about how in these communities people have been “leaning” on each other and praying… And at that point I cursed Mr. Cruz under my breath and I turned off the television to avoid listening to any more hypocritical nonsense. It’s almost as if Mr. Cruz was trying to say: Look how much good comes out of these tragedies. Communities come together, people lean on each other, pray for each other, comfort each other… Yes, Mr. Cruz, communities and people do come together. But why should it take the killing of children to do this? (And let’s face it, even then it only lasts a day or two, or a week, or a month. Then it’s back to looking out for number one.) Why can’t communities come together to create a society that is less death-obsessed and death-worshipping? Does God listen to the prayers of politicians and their supporters whose “hands are full of blood”? When are their hands full of blood? When they do not care for the oppressed and the poor; when they worship at the altar of the NRA. There are no single or simple solutions. But let’s start with our churches. Do we promote social justice? Do we challenge politicians to really do the things that God desires? (And I don’t mean Christian versions of sharia law, which is what evangelical conservatives want.) Do we really preach the gospel or only nice messages to pamper the pampered? Do we comfort the uncomforted and discomfort the comfortable? These are the criteria by which God judges churches – not by what Creed we recite or how we baptize or which patriarchate is number one. Do not mistake God’s idea of “justice” with our ideas of justice. 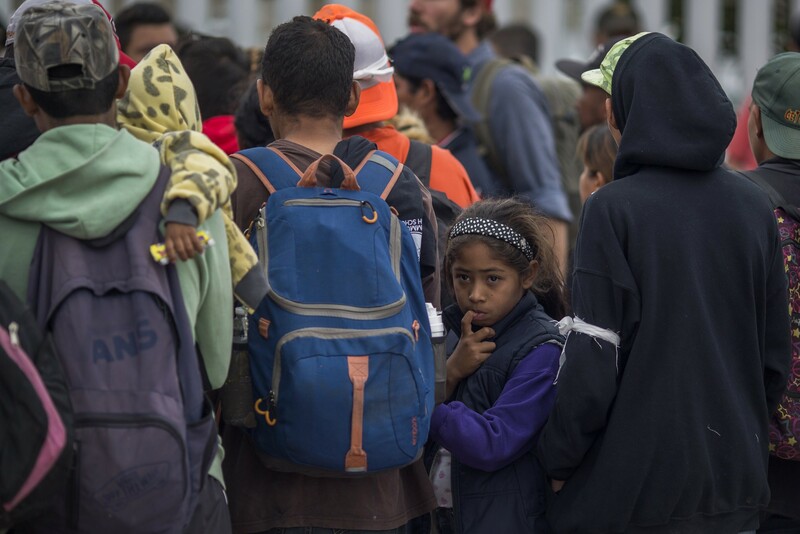 God’s idea of justice is the just treatment of the poor, the outcasts, the oppressed, the widows and the orphans and the homeless, and the refugees – in other words, precisely the victims of our forms of “justice”! Will God listen to the prayers of a Ted Cruz or a Donald Trump, of the communities that suffer tragedies? I hope God will. But God will also not ignore or forget the words he spoke 2,700 years ago through the mouth of Isaiah or Amos. And he speaks them today as well, in the pages of what Mr. Cruz calls the Holy Bible. 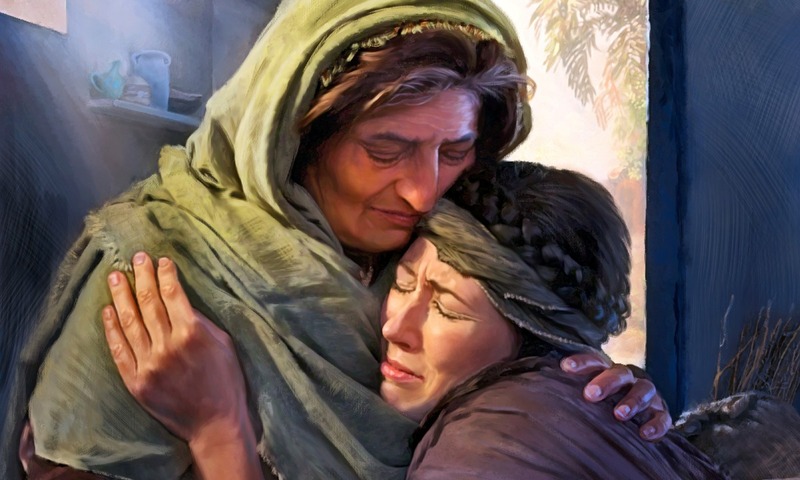 There are many mothers in the Bible, but few that feel contemporary to us. 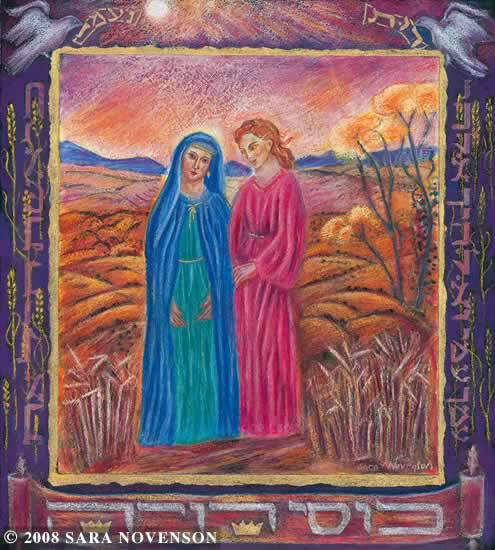 I offer to you today on this Mother’s Day, the Book of Ruth in the “Old” Testament. A marvelous, short book, with a beautiful story of two women, Naomi and Ruth; a story that we can relate to. I will only focus on the highlights of the story. In the days after the Jews had settled in Canaan [perhaps around the year 1,200 BC], there was a famine in the land, and a certain man of Bethlehem in Judah went to live in the country of Moab, he and his wife and two sons. [Moabites were detested by Jews.] The name of the man was Elimelech and the name of his wife Naomi, and the names of his two sons were Mahlon and Chilion; they were Ephrathites from Bethlehem in Judah. But Elimelech, the husband of Naomi, died, and she was left with her two sons. These took Moabite wives; the name of the one was Orpah and the name of the other Ruth. When they had lived there about ten years, both Mahlon and Chilion also died, so that the woman was left without her two sons and her husband. So Naomi returned home together with Ruth the Moabite, her daughter-in-law. They came to Bethlehem at the beginning of the barley harvest. With a little coaching from Naomi, Ruth and Boaz marry. Ruth bore a son. Then the women said to Naomi, “Blessed be the Lord, who has not left you this day without [a redeemer]; and may his name be renowned in Israel! He shall be to you a restorer of life and a nourisher of your old age; for your daughter-in-law who loves you, who is more to you than seven sons, has borne him.” Then Naomi took the child and laid him in her bosom, and became his nurse. The women of the neighborhood gave him a name, saying, “A son has been born to Naomi.” They named him Obed; he became the father of Jesse, the father of David. Note how the story ends. It ends well for Ruth, and she became the great-grandmother of David, the King. And thus Ruth entered the genealogy of Jesus that we read every year on the Sunday before Christmas. A Moabite, a foreigner, in the genealogy of the Messiah! But it also ends well for Naomi. The people bless her. 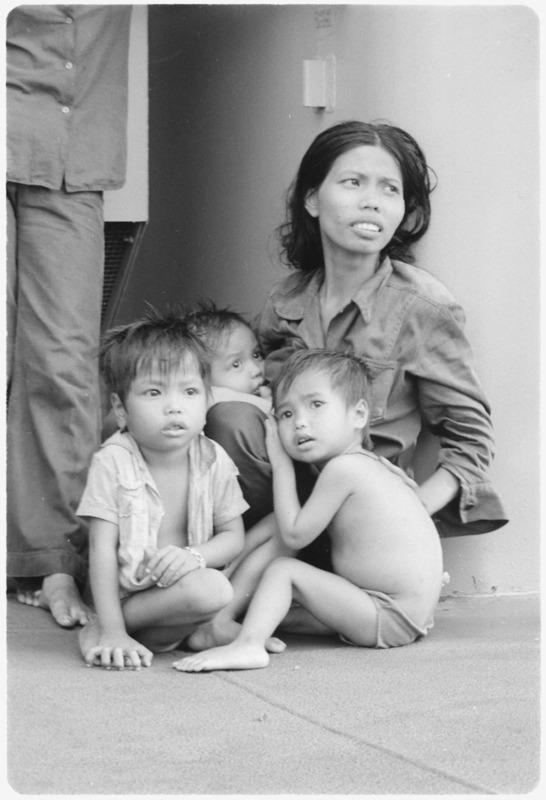 She has been redeemed from her bitterness and poverty, from the emptiness of her life. Ruth’s faithfulness became the means by which God reversed the outcome of Naomi’s life. Never underestimate what you do for your mother or your mother-in-law! God’s purpose is always what the Hebrew Bible calls ḥesed, loving kindness. This is God’s covenant kindness/love. Even when Naomi told the two daughters-in-law to return home she prayed that the Lord will show them ḥesed regardless of their return to Moabite homes. God uses Ruth, the outsider, the foreigner, to turn around the life of Naomi. The Moabites were rejected by the Jews – just as the Samaritans that Jesus used as models in his ministry! Naomi and her husband did not stop their sons from marrying Moabite women, Orpah and Ruth. Tolerance, inclusion – values that every parent, especially every mother must teach her children. In her bitterness, as a widow and both sons dead, she did not stop blessing and recognizing the presence of God in her life and in the life of her foreign daughters-in-law. An agent of God’s ḥesed, loving-kindness. Mothers are central to God’s covenant with humanity. Never underestimate your role in God’s plan. Do not place burdens on your children and their spouses. Let them respond to your faithfulness with their own faithfulness. Teach and demonstrate inclusive love, acceptance of others, of those who are different. Teach your children well, as the CSN song put it back in 1970. Teach your children well, and they will honor you. They will be faithful, as Ruth was to Naomi. Let every day be Mother’s Day! Categories: Sermons | Tags: ancestors of Christ, motherhood | Permalink. 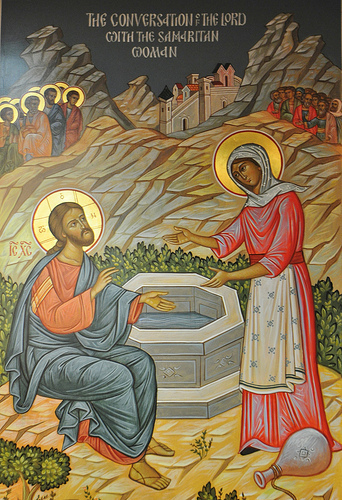 Light and darkness: Jesus at the well at the sixth hour (about noon). Contrast with Nicodemus who came to Jesus at night! When Jesus was crucified, darkness came over the land from noon (sixth hour) to the ninth hour – 3 o’clock. Jesus in John’s Gospel is identified as Creator and life-giver – The Logos: All things came into being through him, and without him not one thing came into being. In him was life and the life was the light of all people. The light shines in the darkness and the darkness did not overcome it (John 1:1-5). Jesus’ thirst was the incentive for the conversation! Was he only thirsty for water? Wasn’t he also thirsty for human interaction, conversation? Isn’t that God’s basic longing? Isn’t that part of why Jesus is the Logos? Why the Bible is the word of God, but also the word of man? 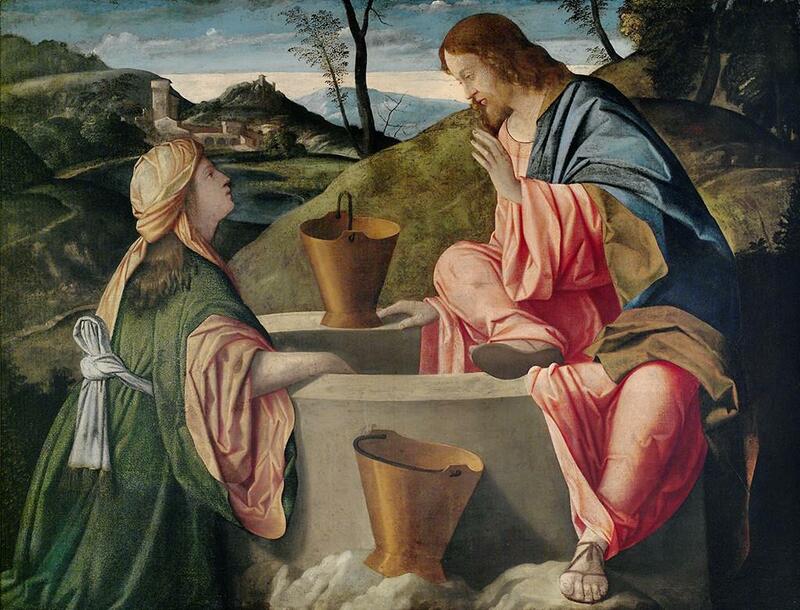 Jesus speaks of spiritual thirst – the woman speaks of literal thirst. Another contrast? Or, rather just two sides of the same basic human craving. The well was a place of conversation in that part of the world – especially for women. Water is essential to life. So is conversation! And I don’t mean texting. The woman switches the subject to religion. Who is right? We Samaritans or you Jews? Where is the proper place to worship God? Here on our mountain or in Jerusalem? Jesus’ answer is shocking: No place – not yours, not ours. We must worship God in spirit and truth. The woman is not convinced – this is too advanced for her, too radical, so she finds a way out: “When Messiah comes, he will reveal all things to us.” Which draws a momentous self-revelation from Jesus: I AM, εγώ ειμι. Jesus habitually resisted identifying himself as Messiah – but he does to this Samaritan woman, a woman not of his own religion. A story in yesterday’s Guardian newspaper told of two native-American teenagers signed up for a tour of Colorado State University. 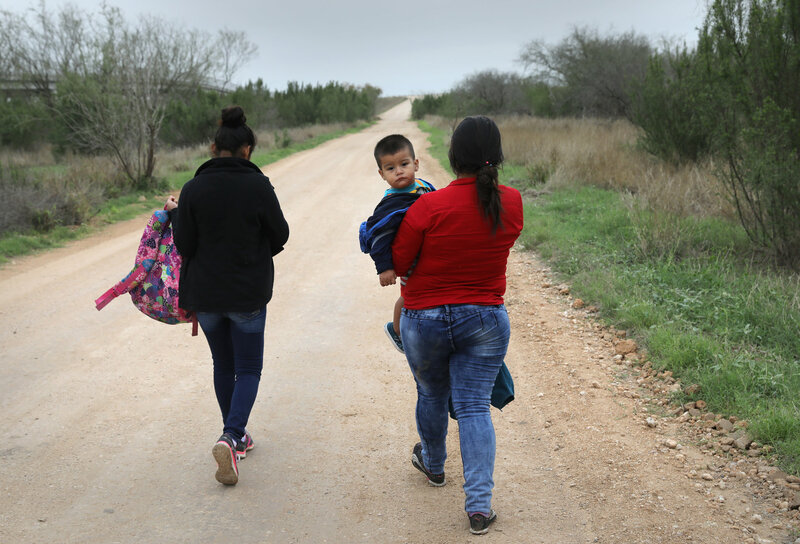 One mother called the police because they looked like “they don’t belong.” She said they were quiet and “creepy” and “really stand out.” “They don’t belong” – that’s what Jews thought of Samaritans, and vice versa. That’s what many Christians today think of people who don’t look like us. What was that line by Rabbi Sacks last week? God asks us to see His image in one who is not in my image. If we worship God in spirit and truth, we don’t see differences. We see the image of God. We see the life-giver Christ, we see the Logos who gave life to all people. Categories: In the news, Sermons | Tags: God's thirst, living waters, Samaritan woman | Permalink.